Kiki came to us as a 2 year old. She settled into our home and lifestyle like she had always been there. Never a moment of bother. A pure joy and fabulous with everyone and everything. Kiki had a very short but none the less successful show career, but it was soon evident that she didn't like showing so we so we let her dictate the terms and retired her. 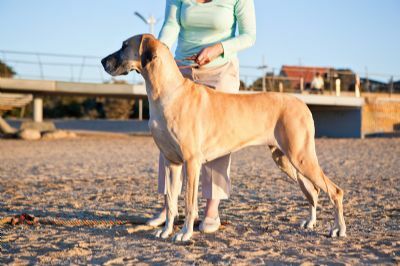 We brought her out one more time, a last hurrah, and she did us proud by taking Open In Show at the Great Dane Club of Victoria Champ Show 2006. We celebrated her 13th Birthday on 26th March 2015. In May 2015 she grew her angel wings and now gets to spend her days with all of her buddies over the rainbow bridge.